Mary Meeker has produced another of her killer decks on internet trends. It's all worth reading but this chart sums up so much. What did everyone do before Facebook, MySpace et al? A few bits of news from the last few days demonstrate just how much is changing in the world of TV. Here in the UK there has been surprisingly little coverage of the announcement of Kangaroo - a broadband service jointly funded by ITV, Channel 4 and the BBC will offer 'catch up' for recent TV shows across all the channels plus archive material. The service will encompass a number of business models (free, pay to rent, buy to own) and will probably ( in our view) be a destination that eventually replaces the current broadband offerings of the stations. Some parts of the picture are still unclear - the role for Five and even for Sky ( giving a service an Australian name and hiring a former Sky director is interesting given how powerful Sky is in UK television). "it turns out full-length streaming of TV series drives incremental viewing of the series [on TV]." "People would watch more content if it fits into their schedule and getting content to the right users with a business model attached is the highest scale success you can have"
The industry clearly sees that TV content has a value outside of traditional TV - the question is whether the current industry structure remains valid. Independent producers are keen to take more value from their work and opportunities to go direct to emerging platforms will be attractive to them. And news today shows that Google intend to be a major player in TV advertising - at their presentation to the UBS conference Tim Armstrong said it would "take Google 3-5 years to become a force in traditional TV advertising"
He also said Google TV is actively looking to expand inventory beyond EchoStar's Dish Network; he described a recent well-attended "advertiser day" at Google for TV and agency execs. "They are at a point now where they believe more measurement is actually good," he said. TV is going to remain hugely important, but the shape of the industry is far from clear. The final report from IBM on the End of Advertising is now available - building on previous reports and drawing data from all the usual sources, there are few surprises. But it is still interesting reading and reminds us all that we're living in interesting times. 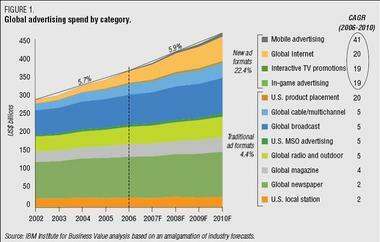 This chart shows that all the future growth in advertising is coming from "new" channels. Following on from their end of TV research IBM have released some more interesting research - which is going to be part of their End of Advertising as we know it report to be published this autumn. The research covers the US, Japan, Germany, Australia and the UK. Again well worth digging through - we were struck by just how dominant social networking and User Generated Content is in the all the markets other than Japan. There UGC is big, but social networks are not so popular - yet. Broadband providers in the UK are getting pretty heated about the the implications on the new BBC iPlayer on their networks. They believe that the increase in data involved in watching video over the internet will place "an intolerable strain on their network" and are threatening to introduce traffic shaping - a neat name for restricting access to the iPlayer service. "The fundamental problem that Joost faces is the fact that the broadband available to North American households simply isn’t fast enough for them to provide image quality comparable to digital cable or satellite, much less high-definition video." And it seems that P2P doesn't solve the issue either. A new report from Cisco forecasts that IP traffic will double very 2 years between now and 2011 driven by P2P and Video, so the problem is not going away. We're convinced that we will see video delivered to the TV via the internet - the next generation of set top boxes will be IP enabled - and that the web will continue to evolve from a text medium to a video one. Its just that the path to that may be a little bumpy. For consumers this will mean that they have to check the small print on their broadband deal to make sure they get the connection that suits their needs. And for brands it means continuing to experiment with advertising in and around video - but making sure that they get what they pay for - did the ad actually get watched? Back from a lovely wi-fi free week in St Ives, I've been catching up on the blogs, trade press and gossip. I've been very surprised at the lack of comment from the advertising/marketing business on the 4 weeks that changed the world - Google, Microsoft and WPP spending around $10 billion to buy adserving companies. Google can now extend their algorithms to display advertising and have cemented their position as the dominant player in town. and WPP stopped buying people companies and bought a technology company. Adserving can seem like the plumbing of the Internet but used properly it can be a very powerful tool. Years ago we (MindShare) bought an IBM campaign that targeted executives at a number of major banks - using DoubleClick adserving we identified people from that bank (through their IP address) visiting FT.com etc and served ads that mentioned their banks names - which was hugely effective. We often sequence ads using adserving, so people see the ads in pre determined order - really good at telling a story or conveying a range. Even though these techniques are not widely used by an essentially lazy digital ad industry, it does hint at the possibilities that these new deals will deliver. Imagine being able to target banners ads based on someones search history -or serve different search copy knowing what banner ads they have seen or even clicked on. Coming soon from Google and Microsoft. Imagine that we can build profiles based on the digital body language of our clients customers and prospects - the ads they viewed/clicked, the brand website pages they read, the email links they clicked on etc - and then buy really cheap space anywhere across the Internet, knowing that we can serve exactly the right ad based on that profile. Thats the sort of thing 24/7 will enable our people across GroupM to do. And having that sort of toy to play with will also help us achieve the number 1 requirement going forward - how to be the best at getting the most out of Google/DoubleClick and Microsoft/Aquantive for our clients. I don't want to use this blog just to big up my employers but to me this is a big deal and I'm surprised that there has been so little comment. If you're with Aegis, Publicis, Omnicom et al (either as a client or an employee) it must be a little worrying to see the world has changed and that you weren't even at the ball game. This is why everyine is so focused on digital. The new data from Ofcom shows that most people who are economically interesting now have broadband - and increasingly a mobile that can access the internet. They're is no going back - these changes are hardwired. Video kills the internet - aaah! With all the excitement over the news that NBC and News Corp are to launch a YouTube rival, (that Google insiders are calling ClownCo) we think people are missing a couple of key points. The relentless growth of Internet usage is driven by broadband adoption - because speed makes the Internet work. We're all accustomed to clicking in a link and something happening straight away. When it doesn't, it tends to be pretty frustrating. Video is where we see this most - watching something on YouTube that keeps stopping and starting is really frustrating. So with the arrival of more places to watch more video content - and presumably more people watching video - can we expect to see the web slowing down? Google think so - Vincent Dureau - head of TV technology at Google - says the Internet won't scale. And a recent report from Deloitte says pretty much the same. People like Google are investing heavily in new data centres to deal with increasing traffic but we expect that P2P technology will play a key role in video going forward. We heard ages ago that the vast majority of Internet traffic is P2P and whilst Greg Verdino points out that video viewing seems to be plateauing is that true of people using Torrent to download the latest episodes of Lost, 24 etc? Google seem to agree as they recently invested in a Chinese P2P company. Are News Corp etc looking at this? - so far their main distribution is through the portals.